This week I’m on the road with The Rooks, making the relatively short journey to the fantastic Gallagher Stadium, home of Maidstone United. Turn right out of TBIR Towers, left onto the A20 and 25 mins later I’m pulling up outside The Flower Pot, one of the best little real ale pubs in Kent for a quick pre-match strategy session with the Lewes Lunatic Fringe before I head into the boardroom at The Gallagher Stadium. You may be disappointed to know that I’m not “suited and booted”. As I approached the gate I was looked up and down and expected to be ushered towards the turnstiles due to my dress code. 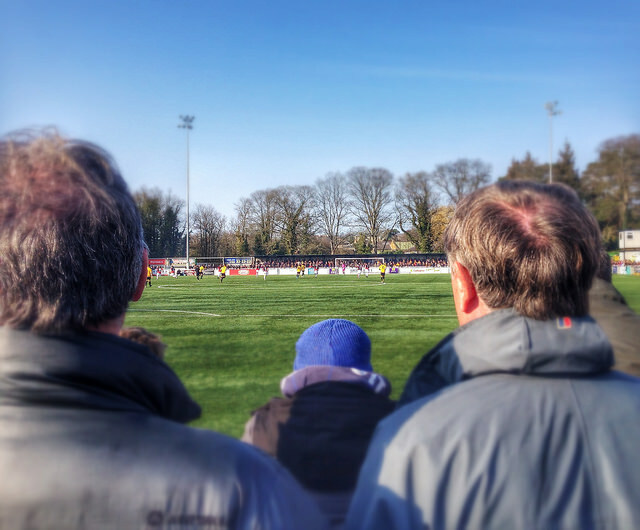 The world has moved on in most places, and the sight of directors in jackets and ties is relatively rare these days, something that has mirrored real life and especially at The Dripping Pan. I’ve worn a tie once in just over a year for work purposes and on that occasion it lasted about an hour. Most companies now have a more relaxed dress code, with ties today becoming a more fashionable item to wear around the wrist than the neck, thanks to the 50 Shades of Grey phenomenon. I fail to see why wearing a tie makes me more acceptable as a club official, a sentiment shared by everyone else on the Lewes board. One club in our league insist on the stuffy dress code to enter their boardroom. One or two give you a funny look when you wander in in jeans but don’t say anything but most give you a warm, hospitable welcome irrespective of what you are wearing. Not that we are a scruffy bunch, mind. So once you have passed the dress code test, what actually happens in the inner sanctum at other clubs? Some clubs put on hot food pre-match, others offer a decent fayre post match (nods to East Thurrock United, Billericay Town and Leiston in that area). Pre-match talk will be centred on recent form, perhaps a brief fact-finding interrogation about budgets (as ours are published on our website we don’t have to resist for long) or the good-old British conversation staple of the weather. Half-time is a time for inflection, a cup of tea and shaking you head at the latest scores. Nobody wants to be too cocky at this stage, irrespective of the score “just in case”. Full-time is about putting on your noncommittal, neutral game face irrespective of the result. A win and you need to hide the smug grin. A defeat and you need to hide your disappointment, blaming it on the ref. I’ve yet to be offered a cigar and only once been given a brandy. You don’t get a guidebook on how to be a chairman. I’m lucky that I have chairman mentors in two generations of Parris’s and Peter Hiscox who have coached me in what to say and when. There is a whole lexicon of boardroom speak. When asked if I’d like a beer before the game, you should say “No thank you. I want to stay sharp just in case I need to come on!” (then laugh out loud). You need to remember to shake everyone’s hand when you arrive, and when you leave, not forgetting to wish them well for the rest of the season. If you are visiting a club where you have had problems in the past then you should talk about the weather, how bad the England cricket team is and whether Man Utd are a spent force (unless of course you are in the boardroom at Old Trafford). Few would have thought a few weeks ago that The Rooks would be travelling to The Gallagher Stadium with a better current form record than The Stones. 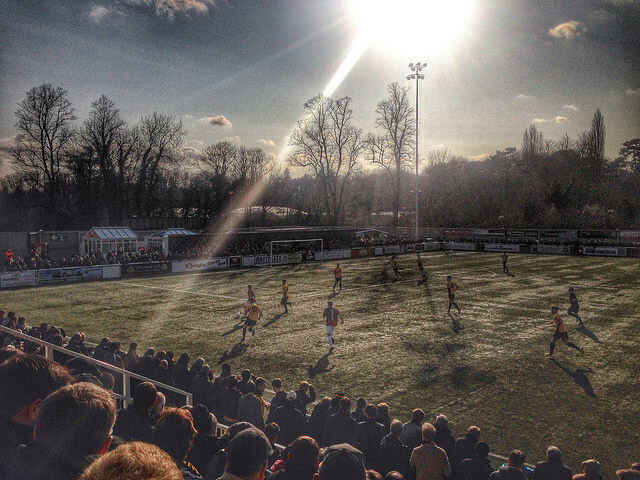 In the last four Ryman Premier League games, the Rooks can boast two wins and a draw, whilst Maidstone United, like the other teams at the top of the league are on a bit of a wobble. Draws against Leiston and Harrow Borough, a defeat against Hampton & Richmond Borough with just a single win against Billericay Town. Is there a better time to visit the league leaders? Despite their current form, the league title appears to be theirs to lose. Who can really deny them their success after over twenty years of struggle. Eight points clear of Margate and due to play their nearest rivals in an already sold-out game at The Gallagher in two weeks time, many will feel a win in that game will be one hand on the trophy. Where there’s time, there’s hope, and with 90 minutes ahead of us that’s the best we can wish for. The Stones have only lost once at home this season, a 3-0 reverse to Enfield Town who ironically recorded the same result last week at Margate. That has been the only home game so far this season where they’ve failed to score in and they have the best home record in the Ryman Premier League. They average 2.17 goals per game at home, conceding less than 1. The Rooks on the other hand have struggled away from home this season, taking just 11 points on the road, the second worse record in the Ryman Premier League. Our 11 away goals is the lowest total out of all 24 clubs. It’s not hard to draw a depressing conclusion from these stats, but football is a beautifully unpredictable game. In the end, Lewes left the pitch pointless. Up until the 75th minute this result was never in doubt, despite the home side rarely getting into third gear. Two May goals, both tapped home from a few yards were early Christmas presents for the home side but then a late rally, thanks to a superb free-kick from James Fraser made the last fifteen minutes interesting for the away fans and very nervous for the 1,950 home fans. The afternoon started very well – a visit to the Flower Pot was, as expected, superb. They only had 10 guest beers on tap. As we left we expressed our regret at this being our last visit for a few years due to Maidstone’s pending promotion. “Don’t worry lads – we’ve got a beer festival with even more guest beers on in late July”. As chairman, I have now arranged a friendly here for that date. The welcome in the boardroom was warm. The lovely ladies who were looking after us, once I had managed to convince them I was chairman, quipped I must be the money man as I didn’t look like a former player. We were wined (well tea’d) and dined (biscuited) and then it was kick off time. You cannot fail to be impressed by the Gallagher and the passionate fans inside. This isn’t a Ryman Premier set up – in fact it is hard to imagine it in the Conference South. 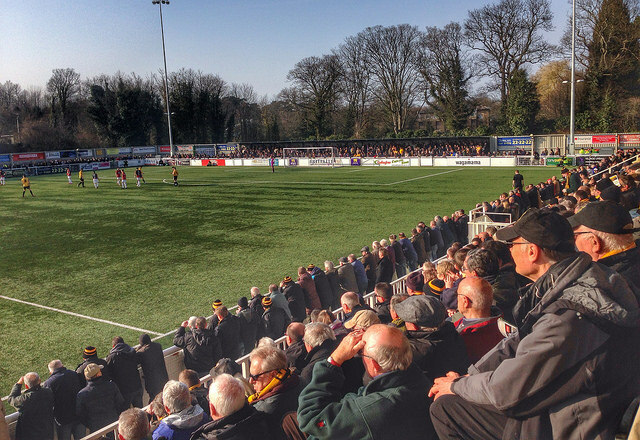 There are League One and Two clubs that would die for the facilities (obviously, less the pitch) and passion the Maidstone fans show. Despite injuries,suspensions and absences, Lewes battled well in the first twenty-five minutes, adapting to the pitch well and playing a passing game. Heck, we should have even taken the lead when Matt Crabb’s shot almost saw the Lewes faithful drop their pints of Whitstable Bay Oyster Stouts (another tick in the box). 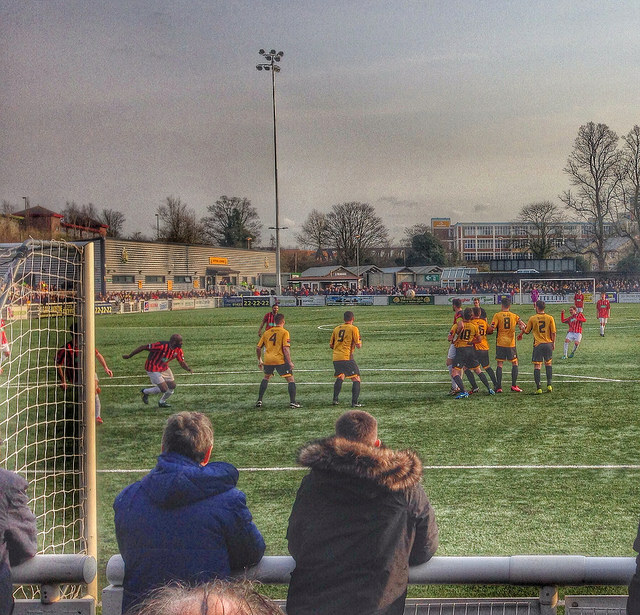 Then a dangerous free-kick flew into the Lewes box, keeper Rikki Banks came flying out and was a second too late getting in front of a Maidstone player who headed on and May had the easiest job of tapping into an empty net. It was disappointing that the Maidstone player didn’t get down on all fours and head it home, just like you used to in the playground before you got a kicking for being so cheeky. Lewes went two down in the 52nd minute when May once again tapped home from three yards out after a great cross from Collin had eluded the Lewes defence. Time to tighten things up? Not really. Faint heart won no fair maiden so they went onto the offensive. With fifteen minutes to go James Fraser stuck a beautiful free kick into the top corner and all of a sudden Maidstone started to wobble. Worgan was the busier of the two keepers and made a couple of good stops. However, the home side hung on for all three points. There was no shame in losing this one, and the Rooks showed some real fight. We headed back to the boardroom, shook hands with our victors, craning our heads to look at the results flowing through on Sky Sports. “How about Dulwich Hamlet, eh?” was the standard line as everyone came into the room. Homemade pea and mint soup, a bottle of Spitfire and a trip down memory lane to the dark days at Watling Street were the order of the day before it was time to depart. Obviously we wish Maidstone every success in the future. Their fans have been through the mill, sticking by them and now reaping the reward. But we will miss this away day – it never fails to deliver on every level (apart from the result of course). This entry was posted in Lewes FC, Non league football, Rymans Premier and tagged Lewes, Maidstone United, Non League football, Ryman Premier League. Bookmark the permalink.